Enter your email address to subscribe to Kushies Magazine and receive notifications of new posts by email. Community Feedback : The first few weeks after baby's arrival whiz by in a bit of a blur - mostly because you haven't slept. It is tough to find enough time in the day to take a shower…never mind cooking nutritious meals! For those of you who are breast -feeding nutritious meals are critical! For the moms who are bottle-feeding it is still important to eat well in order to keep your strength up. Pre-prepare home-made food and freeze it. Having healthy meals in the freezer will be a wonderful luxury when you are sleep-deprived. Make sure you have a good supply! From the Mouths of Babies: Toddler Jackson asked "Mom, what happens when bees hug? Do they just get stung each other?" COMMUNITY INVITATION: Please join the "kushies" and "bees knees baby" facebook sites. We always have great information and offers for our friends. The best way to break up the monotony of a workout is to include your baby! With the recent British release of physical activity guidelines for children under five, we are looking at ways to give our babies and ourselves a little more active time. Here are a few suggestions that will help your child reach important developmental milestones while you tone and tighten. Place your baby on the floor on his or her tummy, lie down on your tummy in a push up position facing your child. You can do a traditional push up or modify it by placing your knees on the floor. 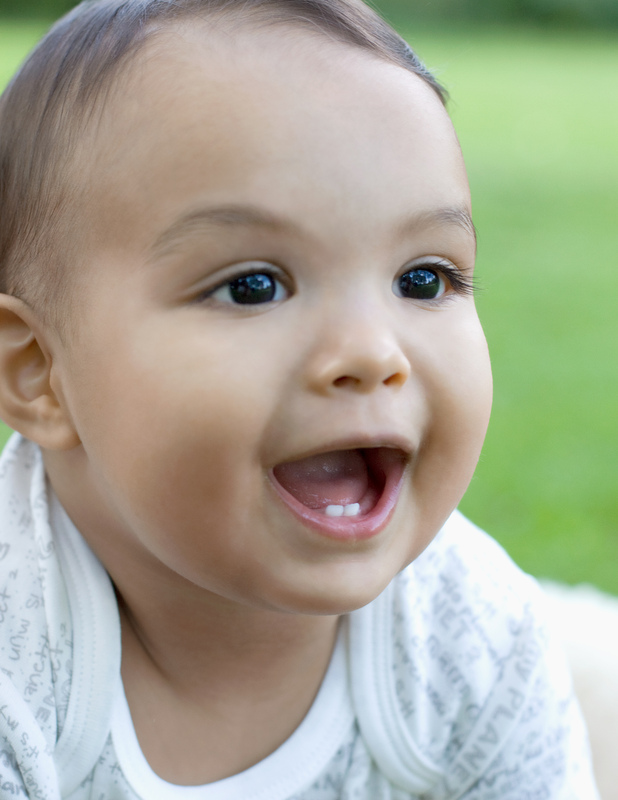 Smile at your baby and while lifting yourself up say, “Peek a Boo”. Your baby’s eyes and head will naturally follow you as you go up and down. This exercise will not only strengthen your upper body, it will also increase the back, neck and arm muscles of your baby, and help to avoid infant flathead syndrome. Sit on the floor with your knees together and feet flat on the floor. Place baby’s tummy against your lower legs. Wrap your arms around baby or hold baby’s hands and gently roll onto your back, lift your feet up so your lower legs are perpendicular to the floor. While on your back gently bounce baby with small up and down motions of your legs. This exercise is great for your abdominal muscles and will increase baby’s balance. It is also a great way to sooth a crying baby. Remember those old pony knee bounces that your Uncle used to sing? Pull out your favourite chant or make one up of your own. Only now instead of sitting passively on a chair, you are going to sit on your fitness ball to bounce your baby. Baby’s love to bounce to the rhythm of music, try using a tune that mixes fast and slow. You might include “trotting” up and down slowly, “walking” smoothly swaying your hips side to side and “galloping” bouncing up and down quickly. This activity will strengthen both you and your baby’s core muscles. Bouncing is also a precursor to walking. Forget the pain, this workout is all gain for you and your child, your baby’s smiles and giggles will melt away any muscle twinges that you feel. Plus you are being a great role model of healthy activity for your child. Together you can strengthen your abs and arms, which of course will lead to better hugs!